While a majority of parents are opting for energetic, preppy, and rough and tough names, there are still others drawn to names with spiritual connections. And what better than dwelling in Buddhism when looking for a spiritual name? Buddhism, encompassing a variety of beliefs, traditions, and spiritual practices, is one of the fastest growing religions in the world. Based on the teachings of Lord Buddha, the essence of Buddhism is to attain nirvana and enlightenment. And Nirvana can be achieved only by practicing meditation and developing wisdom and morals. Buddhist baby names create a positive first impression on people new to it. The peaceful and enlightened sound of these names makes the bearers looking seemingly amiable, relaxed, and approachable. These names aren’t entirely traditional. They just give cues to the virtues and goals that the bearer and his/her parents aspire to. 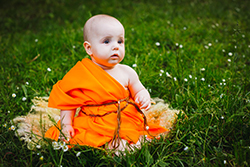 Below, MomJunction gathered a comprehensive list of Buddhist baby names with their meaning. Keep reading!